Earlier on the semester I blogged about Physics 21&22 and how those classes were much different than the Physics classes I had taken last year. Well, here’s an example as to what I’m doing now in my labs. There are two circuit boards on the table. The one in top right is a resistor board and the one of the bottom left is an RC circuit board. The two boards are connected because we are using the resistor boards as the resistance. Now you might wonder what the whole point of this is for and so basically we use the the resistor board to in order to “amplify the current” in our circuit board. This then causes the RC circuit to act as an amplifier. Now, this seems a bit weird and quite frankly, hard to conceptually understand too because you don’t really see what’s going on within the circuit board so whatever you do can seem either right or wrong. 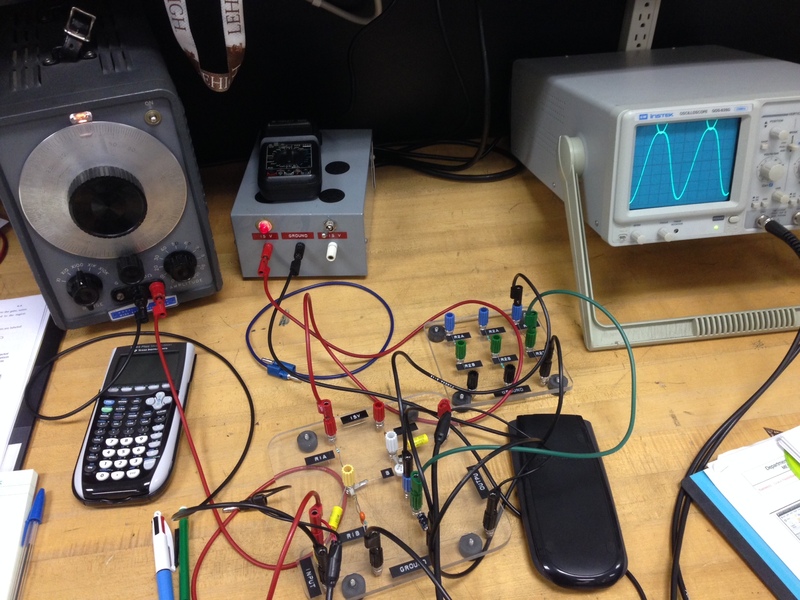 The two boxes at at each ends are the oscillator and the oscilloscope. The oscillator is used to set the frequency and amplitude for your circuit while the oscilloscope measures the the voltage of your circuit using the sine waves on the screen. And in these labs, we also have to write a lab report with an introduction, procedure, data, analysis, and conclusion. This lab notebook will then become our best friend in the lab final because we wont be able to look at our regular printed procedure. From this, I guess one can think about how hard these labs can get when you barely have an idea as to what you’re doing. But hey, at least now I know how to use an oscilloscope!